Don’t miss the 2/13 Conference. 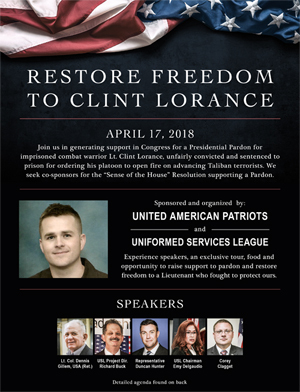 The 2nd monthly Freedom Leadership Conference of 2013 on February 13 will echo the question asked by then Secretary of State Hillary Clinton when she refused to answer for her and President Obama’s refusal to send aid to Americans under attack by terrorists in Benghazi, Libya on 9/11/12. Christopher Carmouche, President of GrasstopsUSA, will blast Clinton and her boss President Obama when he delivers keynote remarks at the Conference, which this month is sponsored by his GrasstopsUSA organization. 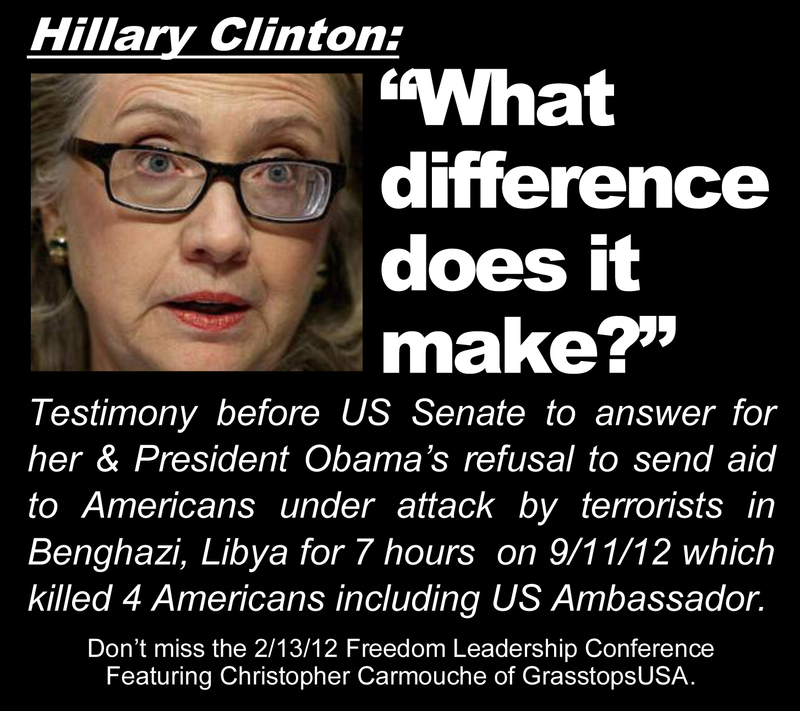 Clinton’s refused to explain why she and President Obama refused to send reinforcements or help to embattled Americans during the 7 hour battle at the U.S. embassy where the U.S. Ambassador was one of four Americans murdered. The Conference keynote speaker will compare the Benghazi coverup to the Watergate coverup under President Nixon, which resulted in his impeachment and, as a number of principled conservative Republican U.S. Senators such as Jim Buckley (NY) called for his resignation, his departure as President. “Nobody died at Watergate” is a refrain echoing through conservative ranks as tomorrow (Thursday, 2/7), outgoing Secretary of Defense Leon Panetta, takes a turn before the U.S. Senate to answer questions. The Freedom Leadership Conference is now in its fourteenth year with a new format of private monthly meetings reserved for members and provisional members only. To inquire about membership you may write RSVP@FreedomLeadershipConference.org. Conference Membership is only approved for those who can demonstrate that they are committed conservatives with a track record of either donating their time or funds (or both) to conservative causes and candidates and are in general agreement with the conservative principles enumerated in The Thurmont Statement (adopted at an earlier conference in Thurmont, MD). The new monthly, private conferences are now usually held at or near Tysons Corner, VA. This new monthly format for Freedom Leadership Conference began this past December 5 at The Marriott Courtyard (see Philippines Legislator Blasts China Aggression http://freedomleadershipconference.org/2012/12/philippines-legislator-blasts-china-aggression/) and then continued in the New Year on January 9 (see William Murray blasts World War on Christians http://freedomleadershipconference.org/2013/01/william-murray-blasts-world-war-on-christians/. The 2/13 Conference will begin as usual with a half hour “coffee social” at 7 PM and then continue through the half hour devoted to the sponsor organization’s topic including keynote remarks. It will continue with short addresses by conservative activists and leaders such as David Denholm, who will announce the first monthly “Saul Alinsky Leftist Smear Conservatives” Award (nominations may be made to LeftSmear@FreedomLeadershipConference.org). Denholm, President of Public Service Research Foundation, has spoken at each of the first two monthly conferences. The Conference ends with another coffee social from 9 to 9:30 PM. For details on the standard format for the monthly conferences see “Agenda” at this website. Future Conferences are planned every month for 2013 with four open dates remaining as conference organizers continue to seek worthy conservative organizations to sponsor and provide a speaker (there is no fee or charge either to the sponsor organization nor any dues for Conference members, although a suggested donation of $5 is requested at the door). The keynote speaker is taken to dinner by the “Leadership Council” of the Conference, each of whose members pays their own dinner cost at a nearby restaurant and provides a $20 donation check to help defray conference expenses (and the keynote speaker’s dinner). To inquire about membership so as to be invited to this and future Conferences – or to confirm attendance if you are already a member or provisional member, write RSVP@FreedomLeadershipConference.org. The location of each month’s conference is only provided to those who are members or have been approved as Provisional (ie. candidate) members. A provisional member is invited to attend one meeting and, if they wish to be invited to future meetings and if there is no objection by any member of the Conference Board then they may be invited to additional monthly meetings and receive email notices of new reports at this website. The Conference Leadership intends to maintain a small but influential membership of the most committed conservative leaders, activists and donors who wish to network together in a collegial but private atmosphere, especially during the monthly dinner with the keynote speaker (which is for the Leadership Council – drawn from the ranks of members). This entry was posted in Announcements and tagged American Border Control, Arthur Purves, China, Christopher Carmouche, conservative, Fairfax County Taxpayers Alliance, freedom, Freedom Center Foundation, Freedom Leadership Conference, GrasstopsUSA, Gun Owners of America, Herbert Borja, Hillary Clinton, Hon. Herbert Serrano Borja, illegal immigration, Larry Pratt, Legislator Herbert Borja, Nobody died at Watergate, Peoples Republic of China, Red China, Red Chinese Seapower, Religious Freedom Coalition, Salute our Servicemen, Salute Veterans, Save our Servicemen Rally, Secure America Alliance, Thurmont Statement, U.S. Intelligence Council, Uniformed Services League, United States Intelligence Council, USIC, Western Conservative Conference, What difference does it make, William Murray. Bookmark the permalink.